The novels of prolific mystery writer Edgar Wallace were the basis for dozens of krimni (crime flicks / murder-mysteries) produced in West Germany throughout the 1960s. The vast majority were detective stories and many also included pronounced horror elements. These stylish and well-shot productions are now frequently seen as precursors to the Italian giallo movement, though they just as often recall the spirit of the old Basil Rathbone Sherlock Holmes films. The Squeaker falls smack in the middle of these two trends; it has the well-structured plotline indicative of the Holmes films, as well as some of the violence and visual style of the gialli. Of course krimni were much milder than their later cousins. With time, these things got bloodier and sexier thanks to crumbling censorship laws and the demands of a changing audience. However, gialli usually spent so much time orchestrating the murder sequences that the screenplays really took a hit and logic rarely ever reared its ugly head. Though the horror elements are somewhat subdued in this particular Wallace entry, The Squeaker finds a comfortable place where the visuals enhance the story instead of attempt to entirely make up for a lack of one. A black-gloved killer nicknamed "The Snake" (who signs his letters with an "S") is going around London poisoning people. And he or she has a really ingenious weapon at their disposal: a slim steel rod which they load up with frozen pellets of mamba poison and shoot into victims. The murders center around a company called Mulford Ltd., which specializes in both the importing and breeding of rare exotic animals, and it's up to Scotland Yard Inspector Bill Elford (Heinz Drache) to crack the case. 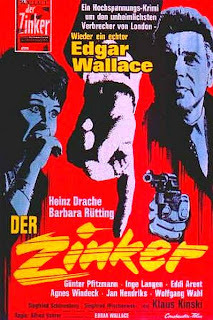 Elderly Nancy Mulford (Agnes Windeck), whose husband had committed suicide years earlier and left the business to her, owns Mulford Ltd., but has dished out most of the responsibilities to manager Frankie Sutton (Günter Pfitzmann), who also happens to be dating her niece Beryl (Barbara Rütting), a mystery novelist. Several other people work in the warehouse tending to the animals, including Krishna (Klaus Kinski), an oddball who barely ever talks and, as the film opens, is seen stealing a black mamba from his work. He's clearly in on things, but is he "The Snake?" Several other characters are thrown into the mix. Feeling charitable, Nancy decides to hire convicted criminal Thomas Leslie (Jan Hendriks), who's just spent two years behind bars, to work in her warehouse. He and Frankie's secretary Millie (Inge Langen) are both seen at various points trying to crack into the company safe. One of the first victims is tied into a crime ring which specializes in jewel robberies where one member fakes having a heart attack to distract police while the others hold up the stores. For some comedy, Eddi Arent's "Telegraph" newspaper reporter Mr. Harras, is injected into the proceedings. His subplot involves him trying to please his crotchety boss Gerald Fielding (Siegfried Schürenberg) by getting the scoop on the murders before a rival reporter for another newspaper can. Things start out a little overwhelmingly. There are a lot of characters to keep track of, and some odd and seemingly random things that happen, but this manages to tie everything together nicely by the end. It's both well-structured and well-written, managing to entertain and keep you guessing as the mystery unfolds. The actors all do a fine job and the characters are enjoyable and adequately fleshed-out. Kinski has a particularly fun role. He gets to crawl around on the floor, fondles and kisses snakes, locks a woman inside a cage with a tiger, has a shipping crate with a corpse and python inside dropped hundreds of feet from a crane and goes crazy with a machine gun at the very end. A man is run over, a mamba is snuck into someone's bedroom and there are some other good suspense set pieces in here. In addition, there are a few amusingly bizarre camera shots, including one inside someone's mouth as they eat a carrot! Director Alfred Vohrer, the busiest director of these kinds of films, left behind an impressive number of krimni. In addition to this one, he also made DEAD EYES OF LONDON (1961), THE DOOR WITH SEVEN LOCKS (1962), THE INN ON THE RIVER (1962), THE INDIAN SCARF (1963), THE MYSTERIOUS MAGICIAN (1964), HUNCHBACK OF SOHO (1966), THE BLOODY DEAD (1967), COLLEGE GIRL MURDERS (1967), THE HORROR OF BLACKWOOD CASTLE (1967), THE APE CREATURE (1968), THE ZOMBIE WALKS (1968), SCHOOL OF FEAR (1969) and TERROR ON HALF MOON STREET (1969) and probably a few more I'm forgetting. Damn, I have a lot of catching up to do. The Squeaker is the first of these I've seen and I hope the others stack up. This was quite enjoyable.